The fate of interest rates was one of the topics addressed Sept. 8 during a Financial Trends Forecast panel discussion sponsored by the Commercial Real Estate Women Las Vegas, also known as CREW Las Vegas. Las Vegas bankers expect the Federal Reserve to raise short-term interest rates by the end of the year. The Federal Reserve will hold its next policy meeting Sept. 20-21. Analysts have suggested the Fed is likely to wait to raise rates since inflation is low and the unemployment rate has changed little. In December, it raised short-term interest rates by a range of 0.25 percent to 0.5 percent for the first time since the financial crisis. What the Fed does with interest rates can impact how much it costs to finance a home and how much it costs companies to take on projects. It also impacts the value of stock. Our economists are calling for a quarter-percent increase before the end of the year, a quarter percent in the second quarter of 2017 and another in the fourth quarter. Kirk Clausen, Nevada region president for Wells Fargo, said he’s met with a group of bankers, and there’s an expectation of a quarter-percent raise, sometime in the fourth quarter. Wells Fargo economists also expect a quarter percent increase in the second quarter of 2017 and fourth quarter of 2017, he said. Ryan Sulllivan, president and CEO of Bank of George, said while there’s a lot of focus on the short end of the curve, not enough time is spent analyzing the intermediate and longer end of the interest rate curve. What drives the financing end of the market isn’t what the overnight Fed Fund rate is, but the five-year and 10-year equation, he said. Sullivan said the Fed’s ability to aggressively move short-term rates up has been hampered by the economic recovery and that the rest of the world is heading in the other direction with its rates. “The 10-year in Germany and Japan is negative. For us to totally separate from what’s going on in the rest of the world I don’t think is an option they actually have,” Sullivan said. John Guedry, CEO of Bank of Nevada said when a discussion starts about rising interest rates, people fear whether that will slow down growth and whether construction projects will come to a halt. The U.S. is at historically low rates, and the impact depends on how rapid rates are increased and how large they are. Increases aren’t always bad, he said. Banks operate on margins and that’s where they make most of their profits, Guedry said. It’s the difference between what banks take in deposits and the cost of those deposits and how banks lend and invest that money. When the margins are compressed like they have been the last seven to eight years, it causes banks that are not as well-capitalized and profitable to succeed, Guedry said. 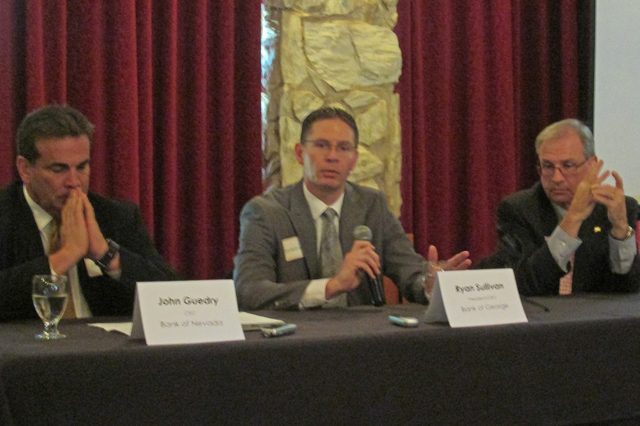 During the panel discussion, the bankers also weighed in on the future of banking in Nevada. Clausen said 45 percent of his workforce are millennials, which is becoming a bigger focus of the banking industry. Branches will continue to be important in the future, but they won’t look the same. Wells Fargo is running a pilot program in Nevada with teller-assisted ATMs designed to focus on millennials who don’t want to wait in line, he said. “They can get immediate assistance by walking over to ATM in the lobby and somebody is there to assist them on a pad. They get the transaction going, so when they get to the ATM, they just have a code number and punch it in and the transaction is complete,” Clausen said. That won’t mean the end of branches, Clausen said. A Wells Fargo survey showed millennials want to use their phones and computer for simple transactions but want to sit down with a banker for a small business loans or mortgages, he said. Sullivan said Bank of George, meanwhile, views technology as a way to support a relationship and face-to-face is important. He cited how the largest transfer of wealth in the history of the nation will take place to millennials. His bank adopted mobile banking 18 months ago since millennials spend about two hours of their day on the phone, he said.